The brekkie classic, the omelette, gets a mighty, meaty twist! This fluffy celebration of beaten eggs is stuffed with oodles of cheese, peppers and sliced ham. Served with multi-grain garlic bread, this eggy-licious dish is your delicious protein dose for the day, good for an anytime quick meal. Love for biriyani knows no bounds! History suggests that the Mughals brought the regal dish to India – though debatable. Large cuts of chicken and rice are cooked with a an exotic blend of middle-eastern spices. The richness of the Biriyani is further accentuated by the flavours of cashew paste and spiced yogurt. 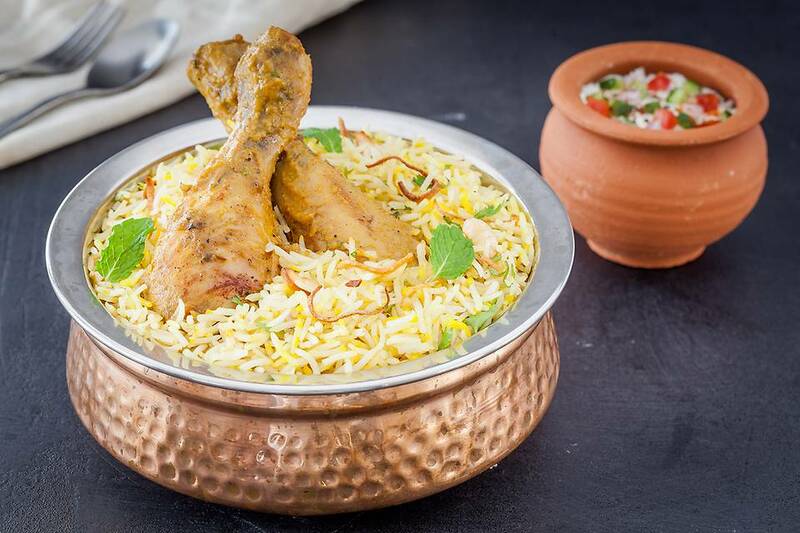 Rich, creamy and soulful, best describes the Mughlai biriyani that was a staple among the royalty. Serves 1. The classic Tibetan beverage Po Cha or butter tea, essentially made by churning tea, yak butter and salt, sure is an acquired taste… but our pastry chefs have found a place for it surprisingly in a dessert! Carefully brewed smoky Tibetan tea is folded into salted caramel-sauce (flavoured with a hint of cardamom) and layered between slices of tea-soaked vanilla sponge with butterscotch and whipped cream and topped off with ganache mousse cream, dark chocolate shavings and crushed praline. Serves 1. Here’s a dessert that truly describes ‘melt in your mouth’ – two layers of freshly baked and humble vanilla sponge take a quick dip in sweet coffee custard and vanilla custard riddled with dark-chocolate chips between them. A layer of Irish cream and fruit-and-nut crumble give this pudding the final touch of oomph. A succulent breast of chicken, flattened, marinated with chillies, garlic and lemon juice is rolled over sesame seeds and baked in foil to retain the juices. The sliced roulade, wonton chips, golden corn tossed with peanut butter, chillies and crushed peanut are packed into a bowl with crunchy, assorted veggies. A sweet honey-lemon dressing accompanies this Sesame Chicken Salad Bowl. Indo-Chinese cuisine has trickled its way into states across the country stimulating taste-buds on the way. Chicken has turned into Sichuan Chicken, cauliflower has turned into Gobi Manchurian, and in this case, paneer has turned into Chilli Paneer! Diced paneer and peppers stir-fried with soy and hot-sauce wrapped in a laccha paratha smothered with a layer of a spicy mint chutney will definitely leave you hungry for more! Smoke-dried jalapenos emit flavours that are quite exotic, the Mexicans knew this well, and thanks to them we get to taste the mildly hot, tangy flavours of chipotle today. Tender sliced chicken breasts are marinated in a citrusy, spicy jalapeno-lemon marinade and grilled. The slices rest on a bed of flavourful, paprika-spiced veggie fried rice. Fresh veggies tossed in a chipotle infused tomato concasse accompany the meaty delight. A dollop of sour cream completes this exotic and exciting dish.